As flexible as Mac OS X’s Dock can be, one feature request that’s been around as long as OS X itself is the capability to have multiple Dock configurations and to easily switch between them. For example, as a tech writer, I often need to take screenshots, and I want those screenshots to include OS X’s stock Dock—my Dock looks nothing like the stock version. Or you may want different Dock configurations for different groups of tasks. Over the years, I’ve covered a number of utilities that provide this functionality, but my new favorite is Thoughtful Tree Software’s aptly named Docks, mainly because of its ease of use and its clear and attractive interface. 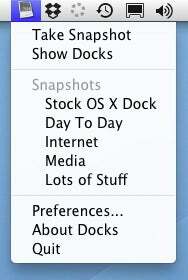 Unlike similar utilities I’ve seen, Docks’s main window shows your various Dock configurations in all their grandeur. A nice touch: moving the mouse cursor over an icon you don't recognize displays the name of that item. When you use Docks as a standard application, you switch between Dock configurations by double-clicking on a configuration in the Docks window, or by selecting a configuration and clicking Restore Snapshot. But I prefer menu-bar mode, which hides Docks's own Dock icon and gives you a systemwide menu that lists your Dock configurations. Choose a configuration from this menu and the current Dock is swapped out for the chosen one. You can also assign keyboard shortcuts for taking a snapshot of the current Dock and for showing the Docks window. A feature fans of OS X’s Spaces will love is the capability to assign each Dock configuration to a specific Spaces workspace; when you switch to a new workspace, the Dock is automatically swapped to match. Unfortunately, you can’t assign a particular Dock configuration to multiple spaces. To accomplish this task, you must create multiple duplicate Dock configurations and assign each to a different space. A minor limitation of Docks is that items minimized to the Dock aren’t saved with snapshots; they aren’t lost when switching Docks, but they are “maximized” out of the Dock when you switch. But Docks’s biggest limitation, at least for me, is that there’s no way to add a stock Dock; I had to delete the Dock’s preferences in the Finder and quit the Dock using Activity Monitor—a procedure that forces OS X to recreate the Dock’s stock configuration. Hopefully the developer will add this option in a future update. Those beefs aside, if you’ve ever wanted multiple Docks but found other utilities confusing or a hassle to use, Docks is worth a look—it gets the interface right.